New Zealand 5-280 (Kane Williamson 114, Peter Fulton 73, Hamish Rutherford 34, Abdur Razzak 2-100) vs. Bangladesh. A responsible century from the top order batsman of the Black Caps, Kane Williamson, guided his team to a sound position in the first Test vs. Bangladesh. 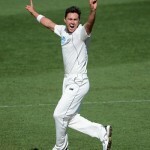 The Kiwis smashed 280 runs in the first innings after losing half of their side in 89.5 overs. The opening Test of the two match series commenced on Wednesday, October 9, 2013, at Zahur Ahmed Chowdhury Stadium, Chittagong. Earlier, Brendon McCullum, the skipper of New Zealand, won the toss and elected to bat first on a placid strip. Peter Fulton along with Hamish Rutherford started off carefully by scoring 13 runs in the first five overs with just one four. The next three overs ended as a maiden while Rutherford hit his second boundary in the 9th one. Fulton tasted his initial four in the following over and the boundaries were dried up for the coming seven overs but most importantly both batsmen were securing their ends. Rutherford hit the first six of the match in the 19th over as the opening stand was dislodged at 57 when he was gone for 34. The young gun of the Kiwis, Kane Williamson, walked in next and made his intentions clear by hitting a couple of fours in the 24th over. Peter Fulton added a few boundaries in the following overs and the lunch break was administrated at 1-93 in 35 overs. The score went past the hundred runs mark five overs later while Williamson gathered two back to back fours in the 48th one. Fulton reached his third Test fifty in the 49th over and Peter Fulton thrashed his half century with a grand six four overs later. The second wicket partnership accumulated 126 runs and enhanced the score to 183 in 62.6 overs. Fulton was caught at that stage by Mominul Haque at cover off Nasir Hossain for 73 from 198 balls with 1 six and 7 fours. Ross Taylor associated with Kane Williamson and the second hundred of the innings appeared on board during the 68th over. 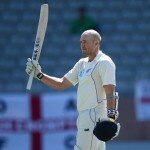 The duo kept on cruising at a reasonable speed and Williamson plundered his fourth Test ton with another four in the 78th one. The third wicket was lost at 244 in 79.4 overs when Ross Taylor went back to the pavilion for 28 and was replaced by Brendon McCullum. The home bowlers struck twice in the dying moments of the game and Kane Williamson was declared leg before wicket off Shakib Al Hasan for 114 from 210 deliveries with 12 fours. Brendon McCullum was the fifth batsman who was held lbw off Abdur Razzak for 21. The visitors piled up 280 for the loss of five wickets when the stumps were taken in 89.5 overs. Abdur Razzak was the highest wicket taker with two whereas Sohag Gazi, Shakib Al Hasan and Nasir Hossain shared one wicket each. New Zealand is placed nicely in the game and an addition of another 100-125 runs can put them on top.